Welcome to my journal page class! I am so happy to see that you’ve joined us. Throughout the next 5 days I’ll be writing about how I make my journal pages. 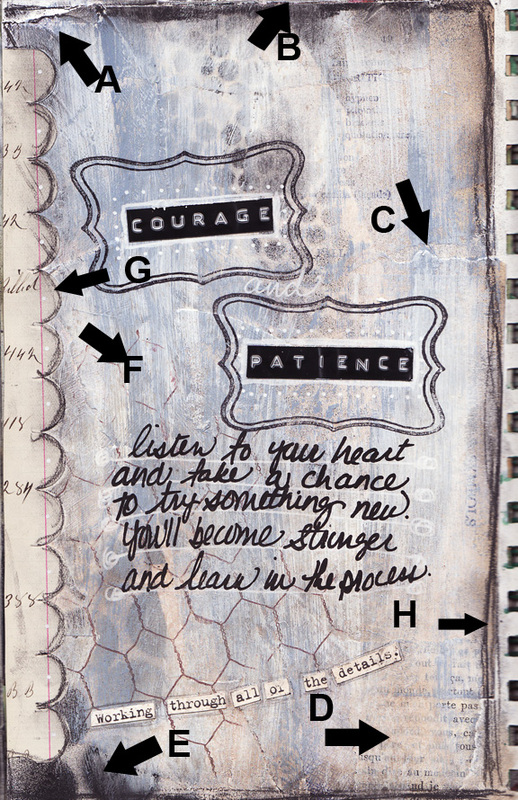 I would love it if you left a comment with tips and tricks you’ve learned in your journal making processes or of course if you have any questions, post away! Disclaimer: I think that making a journal should be a personal experience. Certainly, you can apply these techniques to other art projects on any medium, but your page should come from your heart. After much frustration, I finally found a look that I am happy with. Why am I happy? I am happy because I stopped trying to have pages that look like someone else’s and I noticed that I like to do my own thing. I think about this all of the time…for a long time I thought to myself that I couldn’t draw. I finally realized the reason was because I was trying to draw things realistically…if I close my eyes and imagine what a cat would look like in my imagination for instance, I can draw it much easier than a cat I see on the steet. Same thing applies to the pages. Make each page your own. Another point to note: The Color Binge has what I think are horrible pages in the beginning (They are all posted to the left, in the album), but more pleasing and complex pages towards the end. Why? Practice. I’ve been hitting the “Binge” every day since last summer trying to master paint and journaling. Am I a master? No…I don’t think so. But I am really happy with my pages these days! Let’s get underway! A: I love my pages to look imperfect and messy. This pointer shows some underlying paper that was not glued down perfectly. It came up and bucked after paint. Love it. B: I like to add borders around everything to finish them off and make things more defined. The smudgy-er the better. 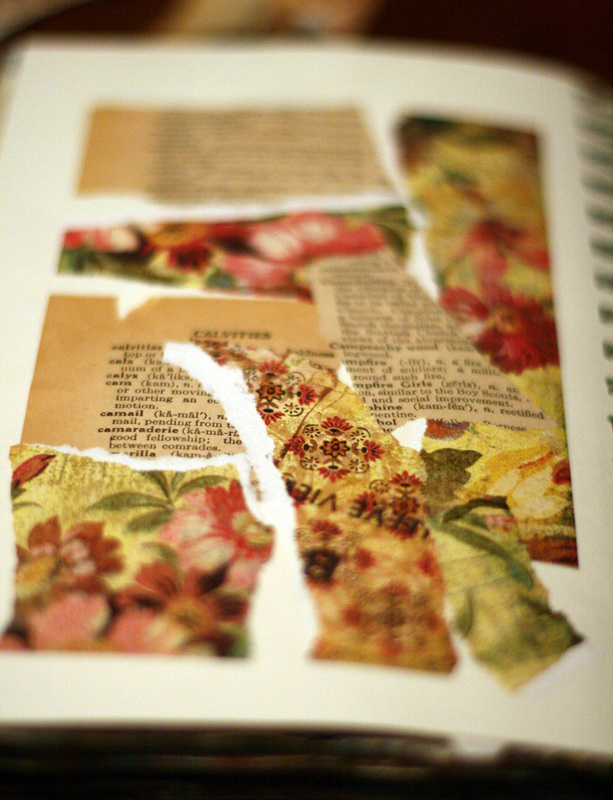 C: The look of torn paper makes me happy. When I tear paper, I try and tear it so that the rough edge is on top. Tear a sheet of pattern paper- if you notice, depending on which direction you tear it in, one side is clean and the other is rough and torn. I’m sure there are probably technical terms for all these things, but I didn’t go to school for art…only gemology. D: Some torn text under the paint, peeking through adds interest. I have printed text of some sort on almost every page. E: Spray paint. I just started using spray paint and even though I like the look of black paint, it is a little too harsh and graphic on these pages. Solution? Apply it first, so it is under the paint., peeking through. Always think about the order of each layer and what can happen when the next layer is added. F: Stamping. Another way to add a layer to your page. For these underlying background images, I never ink the entire image surface. I ink by holding the ink pad over the middle of the stamp and gently brushing the ink onto the rubber. To me, a stamp that is inked “all the way” is too dark and perfect for my style. (Notice for the stamped frames I did in fact ink the entire stamp..they are in the foreground and needed to be heavier.) Rough edges=good. G: Vintage paper. Your paper does not need to be vintage to add to this look. You can simply age paper to make it look vintage with walnut ink or distress ink. Something that bothers me personally is the mixture of new and old papers on the same page. If I am taking the time to age and mess everything up, a new paper would look out of place. I like things to match. H: Scribble border. Use charcoal or black colored pencil (or regular pencil for that matter!) in short, uneven strokes. If your dominant hand is too obedient, then use your other hand to make these scribbles. I love it messy! For the first part of our journaling today, we'll glue on some interesting base paper. We'll be painting over a lot of this paper, so the look of the page will change dramatically. You can use any paper you want for this step! The thought is that there will be some interesting texture and images coming up through the paint when we're finished. 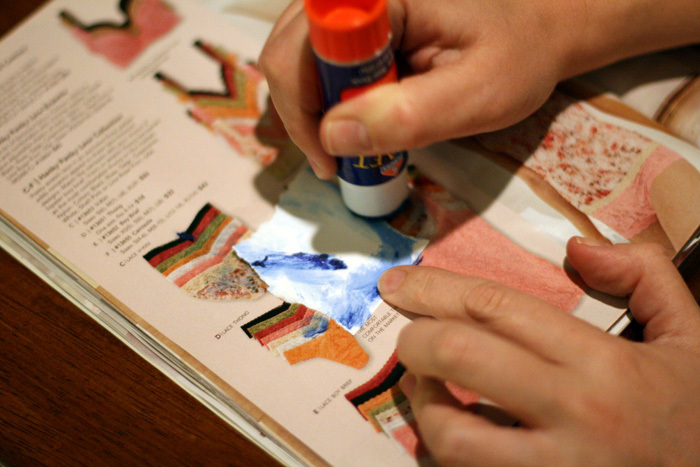 On an old catalogue, spread glue stick over the scraps. Make sure the glue goes all the way to the edges of the scraps- that's what the catalogue pages are for; to catch the extra glue. When one page is sticky, turn to the next and start again. No mess! Here's what my page looks like after the scraps have been added. Do you see where the camera focus is? I hope that word remains visible after we make a mess with the paint and ink... In my mind, I have an idea to write around the edges of this page, so I pushed the scraps towards the center. That's pretty much all I have thought of so far for this page, the other elements will pop into my head once I start adding them! Are your wheels turning? I hope so! Tomorrow we're going to be adding paint. I love Golden fluid acrylics, but you can use any craft paint you want! I think working with acrylics is the easiest...the paint will allow you time to change your mind before anything becomes too permanent. See you tomorrow, bring your paintbrush! Edit: I use this book for my journal. The paper is just right for water and glue! You make my day too!